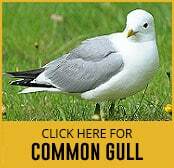 The sheer number and volume of gulls around the coasts of the United Kingdom qualify them to act as pests, and as they become more habituated to human contact by being fed human food and scavenging for scraps, they become even more of a problem. Their droppings are acidic which means that a resident population feeding on your building can cause a significant amount of damage to the outer paintwork as making it hazardous for people entering and exiting the structure. By being able to identify the most common types of gull, you can put pest control measures in place to keep them away from your property. Despite the name, the common gull isn’t found in a huge number places around the UK, with its main breeding grounds being the coastal areas in the eastern part of the country. It looks like a typical seagull with a white body, grey wings and a curved yellow beak and has a very distinctive cawing call. In the summer they migrate north to the inland marshes of Scotland and North East England, whilst the winter months primarily finds them in the fens of East Anglia. However, they are slowly entering built up areas as the winters become milder and food is more readily available from the hands of humans than from the water. At a glance, it’s easy to see why the black-headed gull got its name. 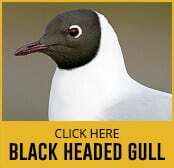 It carries the traditional gull colourings on its body, but with a black tail and head instead of the usual white for most of the year. The black headed gull also has a red beak and red legs, making it instantly recognisable. It’s one of the more common gull types in the UK meaning you shouldn’t be worried about treating it as a pest. In terms of living patterns, it can be found just about anywhere inland away from the coast, with wide open fields and lakes being its preferred habitat. They are a social group of birds which means that when one arrives at your property, many more are likely to follow with their loud voices and aggressive behaviours, especially if they sense that food is abundant nearby. The great black-backed gull is one of the largest types of gull to be found in the UK, and its size alone makes it a menace to other wildlife as well to passers-by. As the name suggests, it has a deep black back and wings, but the head is small in comparison to the rest of the body. What it lacks for in the size of its beak, however, it makes up for in aggressiveness, and will actively hassle other gulls and people for food. They are almost exclusively coastal birds during the spring and summer months, choosing sand dunes and secluded beaches as their natural roosting bases. However, in the winter, they flock to the eastern counties and are beginning to target rubbish tips and landfill sites as sources of easy food. 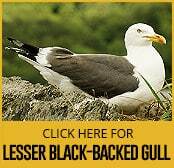 This is one of the rarer breeds in the UK, and there are only 65,000 lesser black-backed gull breeding pairs left, although their numbers are slowly rising again. They like high cliffs, meaning that they’ll target coastal areas, especially during the summer months when tourists bring their crumbs and scraps to town. 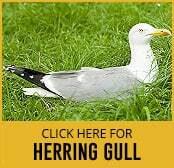 You can also find a lesser black backed gull in high inland areas such as moors or hill ranges, but as with a lot of gull types, they have worked out the easy feeding to be had at landfill sites and more populated urban areas. 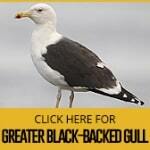 They look like a small version of the great black-backed gull with very similar markings. However, the size difference is enough to tell them apart, as are their stark yellow legs that will catch your eye almost immediately. When most people talk about gulls, they will have a picture of a herring gull in their heads. They are loud, aggressive and seemingly always hungry. These gulls have become fearless in recent years and are not above approaching humans directly and using scare tactics to get at their food. The increased use of landfill has seen them come away from their traditional coastal roosts and they will now happily take up residence in tall buildings to give them the best viewpoint. In terms of identifying a herring gull, look out for the large, hooked bills that have a very distinctive red spot underneath. As for the rest of the body, you’ll see large grey wings, subtle red legs and an instantly recognisable black and white tail pattern. You’ll also be able to hear them from a long way off. • Glaucous gull (Larus hyperboreus) – a more grey bird with pale wingtips that overshadows a herring sized gull. • Iceland gull (Larus glaucoides) – a small bird with white markings that only appears during winter months. • Kittiwake (Rissa) – similar in size to a herring gull with a bright yellow bill. • Mediterranean gull (Ichthyaetus melanocephalus) – similar in markings to the great black backed gull, it’s a little smaller and only appears during the summer months in the south of the UK. • Little gull (Hydrocoloeus minutus) – the distinctive ‘W’ pattern on the wings helps to identify this dainty bird. The main problem with dealing with gulls as pests is that a lot of them are on the Amber warning from the RSPB, giving them a protected status under law. This is why you’ll need to get professional advice and help in removing them from your property as doing so by yourself could endanger the species and land you with a big lawsuit. Professional pest control firms will have humane and legal ways of helping you deal with your gull problem.